This is 42 year old female with a breast capsule mass. 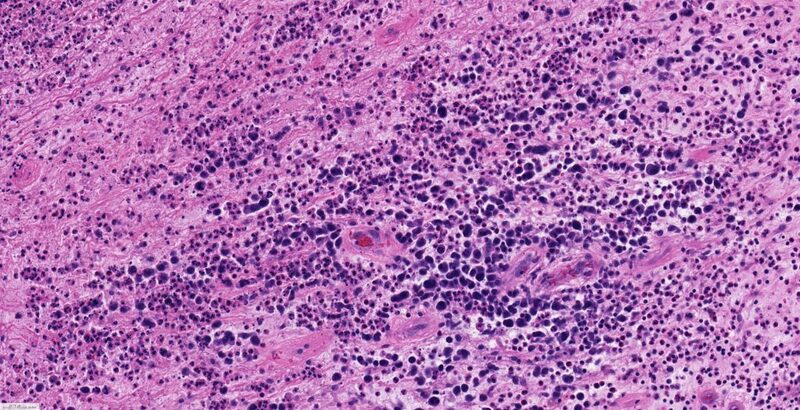 Histologic Description: Within the fibrin surrounding the capsule of the implant are large pleomorphic cells associated with mitotic activity. These cells have irregular nuclear membranes, and are discohesive. These cells labeled for CD30 and CD43 along with EMA. 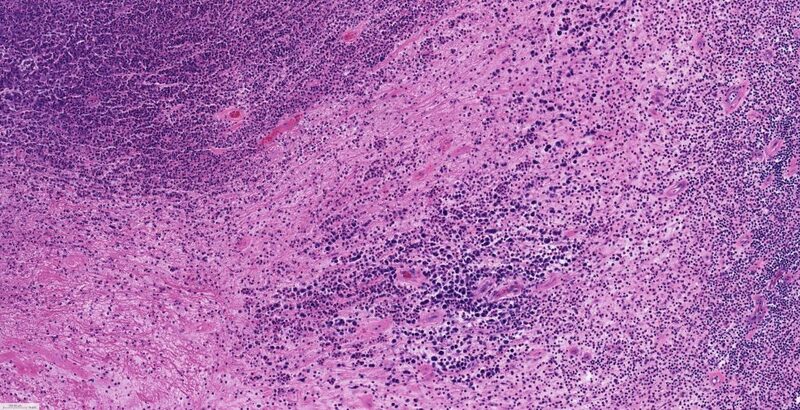 Differential Diagnosis: The malignant cells of capsular anaplastic large cell lymphoma may demonstrate some cohesion and this along with the EMA immunoreactivity may suggest a poorly differentiated carcinoma, which would be a more common diagnosis. The irregular nuclear membranes along with the CD30 immunoreactivity supports the diagnosis of lymphoma. Angiosarcoma would be vasoformative, and would label for CD34 but not CD30. 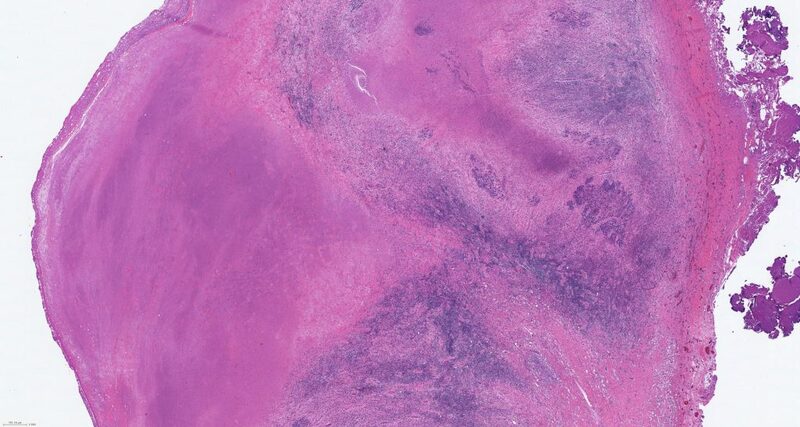 The atypia seen in the current case is much greater than that seen in reactive changes. 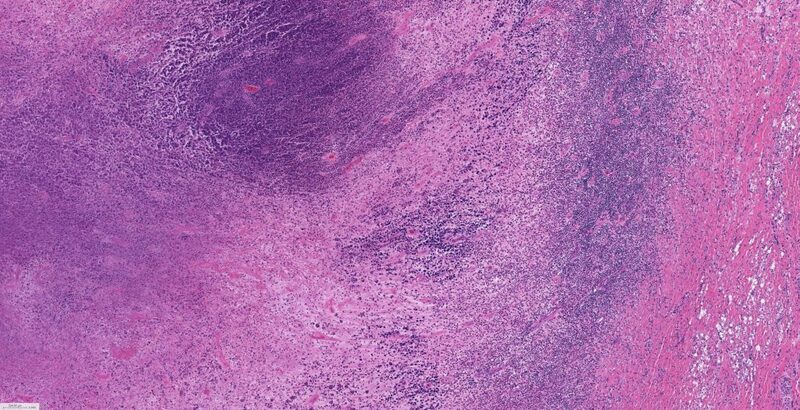 Cases of breast implant associated anaplastic large cell lymphoma that present as a seroma (effusion only) have a favorable prognosis following surgery, whereas those that present with a mass extending beyond the fibrous capsule have a worse prognosis and may require chemotherapy. Reference: Archives of Pathology and Laboratory Medicine 2014; 138:842-846.